I am the worst - blogger, that is. I haven't posted a word since 2011, so apologies for that. I was embroiled in obligations for my day job plus enjoying having my daughter home from university over the winter break and nary a word was written nor photo taken. 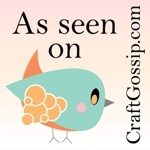 But with 2012 well under way, I'm back with renewed vigour! Now comes the reason for this post's title and question mark. 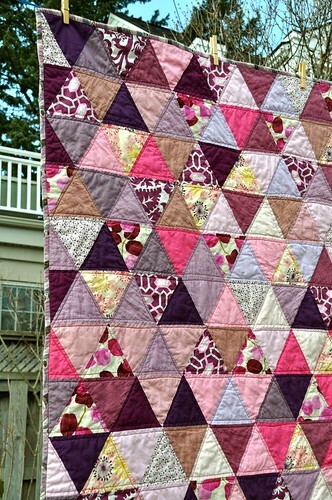 I've been working on a little quilt for my daughter's friend; I finished the top awhile ago and posted photos here. 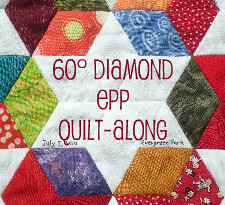 In the mood for a quick piecing project, I grabbed a handful of FQs from The Workroom on one of my trips to Toronto and used my new Marti Michell ruler to cut them into triangles. 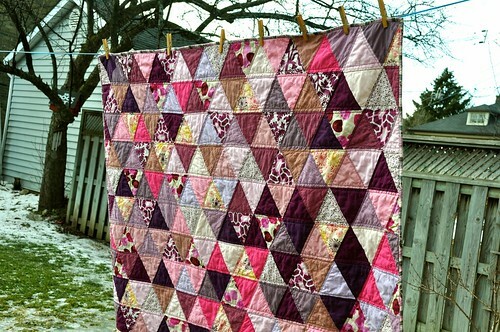 When I had finished piecing the top, I was seriously underwhelmed. 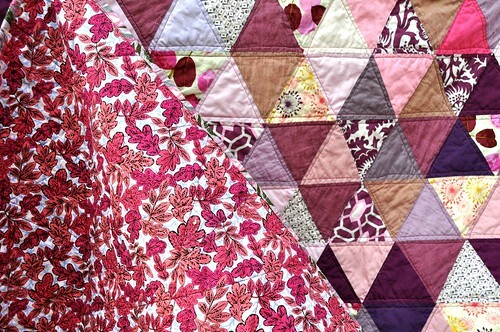 But I have down this road too many times not to recognize the jadedness that comes from spending too much time with a quilt top jammed up against my nose while wrestling with it under the needle. 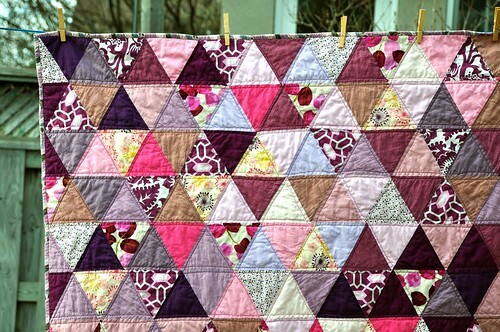 I have infinite faith in the restorative power of the wash/dry cycle that turns a homely project into a quilt that one feels proud of. But this time it didn't work. Shall I enumerate all the failings of this little critter? First, it's too small. 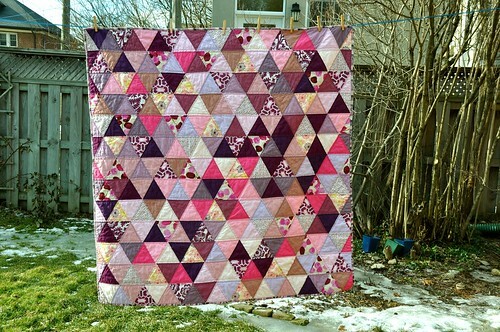 Finishing at 57" square, it is neither fish nor fowl: too big for a baby quilt and not big enough for a lap quilt. Second, the points are all ahoo, which leads to the third flaw: the method I used for quilting it - straight lines - only accentuates the wonky - in a bad way - seams. Fourth, I don't think the mix of warm and cool colours works all that well, and I think there are too many different prints. What I do think works well is the voile binding; it's lovely and soft. And this is the first time I've worked with shot cotton, and it is truly lovely, although a royal pain to work with since it stretches all to hell. 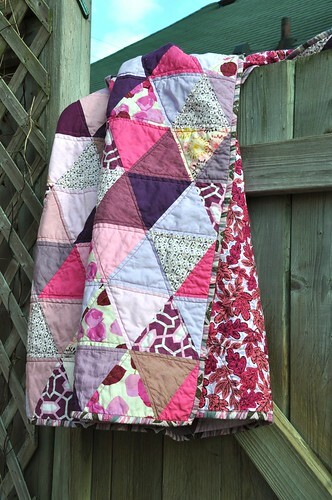 I even debated sharing the evidence with you all, but in the interest of honesty, I loaded all the photos of this quilt into a Flickr set called The Worst. So I was gobsmacked when I started getting comments about how much people liked it. It's gotten loads of pins on Pinterest. Of course, the madcap points aren't really obvious from the distance most of the photos are taken from, but the clashing warm/cool colours and the haphazard prints are glaring. The positive feedback is making me take another, more careful look at it. I can't bring myself to love it, but maybe it isn't The Worst.